Our spring Lead the Way to Literacy Leadership Talks called upon national experts in the areas of language, literacy, assessment, and accelerating proficiency to share their research and experiences in the classroom. Here we share 5 practical tips from their webinars on how to support literacy growth—along with a link to their full Leadership Talks. Learn from struggling readers to help all readers. Lamont Repollet and Sancha Gray, Superintendent and Assistant Superintendent of the Asbury Park School District, share the journey that turned their district from struggling to thriving. To raise literacy achievement across the district, they followed the ACE mantra—Assess, Create, Execute. Sancha Gray led the charge to assess every program in use in the district, create a cohesive plan for improvement, and execute across the district. 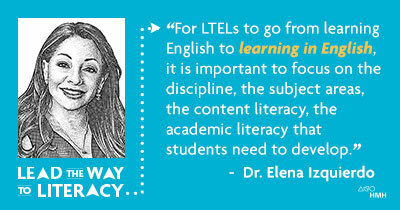 Dr. Elena Izquierdo highlights the kinds of policy and practice shifts required to help our long-term English language learners achieve their full potential. We must make sure we hold our English learners to rigorous standards and give them the opportunity to struggle with academic language. Offer a steady diet of complex texts. In their Q & A panel discussion, assessment experts Dr. Ted Hasselbring, Dr. Malbert Smith, and Dr. Julie Alonzo focus largely on what Ted Hasselbring calls “Continuous Stealth Assessment.” The many advantages of a continuous measurement model highlighted by the panel include allowing more time for instruction, yielding more precise and reliable results, and enabling more responsive instruction. Watch the complete Lead the Way to Literacy spring Leadership Talks.